These two bed and breakfast inns couldn't be more different! One has a decor set in the style of the 19th century. 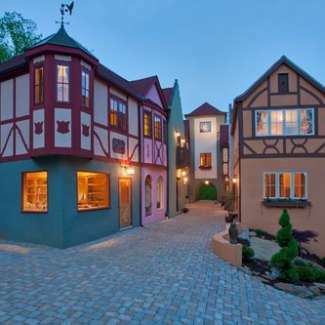 The other is modeled after a European village. Both, however, offer a superb romantic getaway experience! 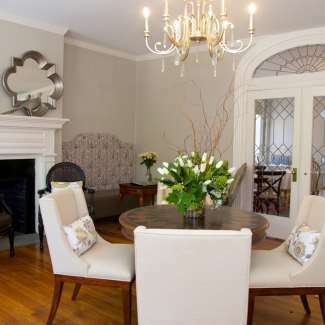 With a decorative foot in the past, the Dinsmore Boutique Inn is a fully refurbished 19th century home. Named after the home's builder and architect, James Dinsmore, the house itself is a testament to the man's craftsmanship and legacy. Dinsmore had a hand in shaping famous Virginia presidential homes as well as the University of Virginia. So when it came time to upgrade this historic home, it was important to simply add to its existing beauty. And Dinsmore Boutique Inn has done that extremely well. Boasting decadent fabrics and decor, the Inn re-vamped every bathroom, modernized every room, upgraded every mattress, and replaced every window treatment. It's a stunning transformation that only adds to your experience while staying there. In addition to their fabulous breakfasts, you can also opt to add their in-room Farm Breakfast Basket and have mimosas in bed! (There are other add-on's as well.) Dinsmore Boutique Inn is 10 minutes from downtown. So there's a lot you can enjoy. The downtown mall hosts the Paramount Theater, and there are plenty of restaurants or shops. It's the perfect romantic getaway for those who like a touch of history mixed with a cosmopolitan flair! You can book a stay here. Looking for something completely out of the ordinary? Then you'll love the Fenton Inn. It's a stylish European village in the heart of the Blue Ridge Mountains and Wintergreen Mountain. Truly a one of a kind handcrafted work of art, Fenton Inn combines that craftsmanship with European tastes and amenities. While there's plenty to do with wineries, breweries, the Appalachian Trail, and national parks, it's the inn itself that's the main draw. With cobblestone streets, it's a complete village including a town square, bakery, theater, clock tower, spa, gym, and store. It's a must-see destination! You can make your reservation here. Both of these inns have their own style and ambiance that's a perfect romantic getaway. You can't go wrong with either!